It was a week of “last ofs”. 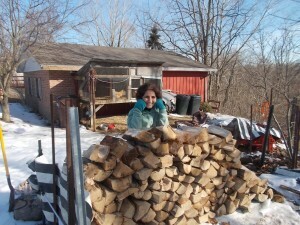 We split and stacked the last of our wood (check out our smiling photos) and we had our last sled ride of the year. Son Jason videoed it not just for fun but, as he said, “to have evidence that you, Mom, actually made it down the hill.” Well, I not only made it down the hill but I went farther than any of the kids. So there. 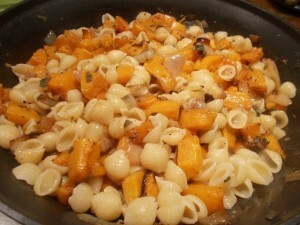 I also used the last of our garden butternut squash to make a nice pasta dish, which I’m sharing today. All these “last ofs” remind me that spring is not far away. This is a real impromptu, go to taste, recipe. The original called for fresh sage and I only had dried from my herb garden. Unless you add red pepper flakes, don’t look for a lot of spice in this dish, just a nice, mellow flavor. Preheat oven to 375. Mix squash, onion, salt and pepper and enough olive oil to coat. Lay in single layer on pan and roast about 30-40 minutes, until squash is tender and lightly browned, turning halfway through. Cook pasta. Cook butter, sage and garlic until garlic is golden. Add squash mixture, and pasta (I didn’t add all the pasta at once) to taste. Add more sage if you like. Add red pepper flakes if you want. Sprinkle with cheese. Serves 3-4. Worth sharing again. Poke holes all over with fork. Put in microwave on high for a few minutes. This softens the skin. Remove with mitts. Let cool and peel. Next Next post: Champ or colcannon for St. Patrick’s Day – what’s the diff?